"Bifiform" is a polycomponent probiotic that is used for the treatment of dysbacteriosis, and also in the gastro-intestinal disorders of various origins. The drug is available in different dosage forms and can be administered even to babies. "Bifiform" for adults is a capsule enteric shell, inside of which is a lyophilisate of lactic acid bacteria (bifidobacteria and enterococci in dried form), and such auxiliary substances, such as lactulose, lactic acid starter culture, etc. "Bifiform Baby" in addition to good bacteria contain in its composition more, and b vitamins Medication for kids is available in a sachet and in tablets is not a medicine, and biologically active additive to food. "Bifiform" is prescribed for the treatment of diarrhea and dysbiosis that may occur due to diseases of the digestive system, intestinal infections, low immunity, certain medication. The drug can be taken not only in the advanced stage of the disease, but also as a preventive measure and to maintain immunity in frequently ill children and adults. Adults and children over two years of age, "Bifiform" one capsule administered 2-3 times a day. In severe cases, it can be chosen a different treatment regimen, for example, 2 capsules, 2 times daily or 1 capsule 4 times a day. With acute diarrhea enough three-day therapeutic course. In other cases, the duration of treatment can reach two to three weeks. "Bifiform" you can drink both before and after a meal. It is important to maintain equal time intervals between doses. "Bifiform Baby" is prescribed to children aged 1-3 years. Kids give one powder at a time, and children older than two years is one chewable tablet. The number of doses of the drug can reach 2-3 times a day. The drug can be given and children over the age of three years, but in this case, the dose should be increased to two powders/tablets 2-3 times a day. The duration of treatment is 5 days. Children the doctors recommend giving "Bifiform Baby". It comes in liquid form and suitable for use even in newborns. The dosage is determined by your doctor depending on the severity of the condition of the baby. In the treatment of "Bifiform" at the appointed doses side effects usually do not occur. However, if you exceed the dosage can appear abdominal pain, constipation, flatulence and other disorders in the digestive system. The only contraindication to receiving the drug is the idiosyncrasy of its components. Advice 2 : How to apply "Bifiform"
The preparation "Bifiform" refers to the group of probiotics, it is designed to normalize work of intestines. The tool is produced in capsule form with enteric-coated, capsules contain bacterial cells of bifidobacteria and enterococci. 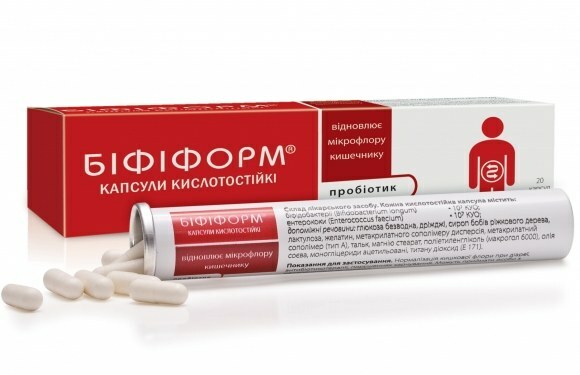 "Bifiform" is used for the treatment and prevention of intestinal dysbiosis in colitis, gastroenteritis, during treatment with antibiotics and sulfanilamides, with low and high gastric acidity, gastro-intestinal disorders of various origins. The drug is also used for the treatment and prevention of chronic diseases of the digestive tract, for immune support, acute and chronic diarrhea of different origin, with lactose intolerance, dyspepsia, flatulence. "Bifiform" contains bacterial strains possessing high level of resistance to the effects of antibacterial drugs. Bifidobacteria and enterococci inhibit the growth and reproduction of pathogens by producing lactic and acetic acid. The drug improves the absorption and synthesis of vitamins, promotes better metabolism of protein, complex carbohydrates, fats, normalizes intestinal microflora, stimulates the correction of disorders of the digestive tract, increases the body's resistance to adverse factors. The drug is taken with or without food. "Bifiform" adults and children aged two years is necessary to drink one capsule two times a day, the maximum daily dose is four capsules. The children, ranging in age from six months to two years, give one capsule of the drug twice a day for children ranging in age from six months to two years, give the contents of half a capsule twice a day. If your child cannot swallow the capsule, its contents need to mix with water. The course "Bifiform" on average is 10-21 days. In the gastro-intestinal disorders, accompanied by acute diarrhea, the drug must be taken two or three days. Newborns and children of younger age group can be given "Bifiform Baby" in the form of a suspension or an oil solution. It is composed of streptococci and bifidobacteria. This drug give the child one time per day in an amount of 0.5 ml. the Length of treatment is ten to twenty days. "Bifiform" and "Bifiform Baby" is well tolerated and do not show side effects in addition reactions of individual hypersensitivity of the organism to their parts. These drugs are contraindicated in cases of known sensitivity to the ingredients. "Bifiform" and "Bifiform Baby" store in a dry, dark place at temperatures not above 15°. The shelf life of drugs - two years. The human intestinal microflora can be maintained by different bacteria species. But illness or taking antibiotics can affect the body, leading to intestinal upset. Modern medicine offers many tools aimed at maintaining and restoring the microflora. One such product is Suitable. Bifiform prescribed not only for adults but also children. It contains bacteria and lactobacilli, due to which the body is fighting the problem. Price Bifiform will not please everyone, but the savings never hurt. So you should pick up analogue Bifiform cheaper. The drug Linex is designed to return the gut to its usual acidic environment. Thanks to bacteria in its composition, pathogens die. Linex soft pomogaet to get rid of the problem, so it can be used even infants. If you suffer from fever (more than 38C), the useful bacteria that carries the drug will die in the beginning. Atsilakt aims – increase of acidity in the environment of the intestine. One of the advantages of this drug is to mention his rapid response. Bifidumbacterin – another cheap analogue Bifiform. Its main goal is to reduce the effect of fermentation in the gut, for this reason it should be combined with atsilakt, which in turn deals with the adjustment of acidity. In any case, you should consult with your doctor about the possible replacement of the drug Bifiform on cheaper analogue.